Classic film fans on Twitter found themselves face-to-face with another liar. 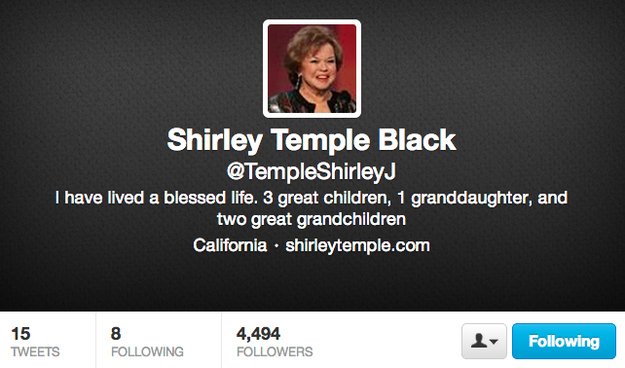 Someone pretending to be Shirley Temple on Twitter. I fell for it and so did a lot of other people. 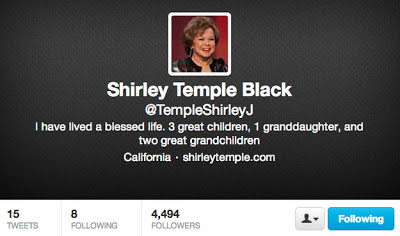 Shirley Temple wouldn't be the first classic film star on Twitter. Both Shirley MacLaine and Debbie Reynolds have accounts. For a few folks, Shirley on Twitter was too good to be true and her tweets were deemed suspicious. Reps of the retired actress confirmed that the account was a hoax and it was quickly turned into a SPAM account. I guess having a major figure of film history on Twitter is too good to be true. If you ever see a Mickey Rooney or Deanna Durbin account on Twitter, don't believe it! (Watch Ben Stiller explain Twitter to Mickey Rooney). 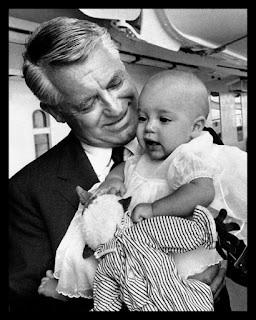 Recording of Cary Grant on the Phone with his daughter - Posted by Warner Archive on their Tumblr, this is absolutely charming. Listen to it here. I highly recommend the memoir Good Stuff: A Reminiscence of My Father by Jennifer Grant. You can read my review of the book here. Hats, Hats, Hats! - The Peabody Essex Museum in Salem, MA currently has an exhibition devoted to Hats. And I just love hats so it was imperative that I attend. For the occasion I wore my best cloche hat, a cream and black wonder made by the San Diego Hat company and acquired from Kate Gabrielle. I got so many compliments on my hat and someone even asked to take my picture. Wow! We all know hats were an important accessory in classic movies. Hats are not as appreciated today as they were back then but that should change! I wasn't allowed to take pictures inside the exhibit unfortunately. We did get to see hats worn by Charles Boyer, Marlene Dietrich and a couple 1940s toppers from model and burlesque dancer Dita Von Teese's collection. It wasn't the best exhibit and there were an unfortunate paucity of men's hats but I still had a great time. i love that ward "paucity", i think its awesome you used it!